You fair Southerners know the bane that is the fire ant, and no where is the problem more predominant than deep in the heart of the great state of Texas. But now the fire ant is facing a predator of its own. Researchers at Texas A&M University have introduced a tiny phorid fly, originally native to South America, whose task it is to lay its eggs onto fire ants. 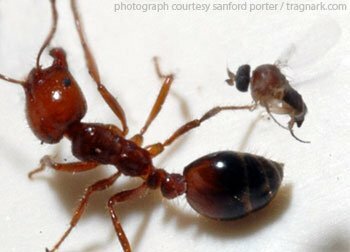 These eggs hatch into maggots inside the ant, and begin to eat away at the ants’ brains, essentially turning the fire ants into tiny little zombies. The ants wander around for up to two weeks while the maggots eat away at their brains, until at last the ants’ heads fall off. Then the maggot becomes a fly and is ready to start the cycle all over again. Join me tomorrow when I talk with Patrick Osborne at KTRH Houston, 740 AM on the local dial, at 10:15 am CT (8:15 AM PST). Surely we will speak of zombie ants, haunted hotels, and many other things that are truly bizarre! For those who don’t live local to Houston, you can listen live online. This entry was tagged Beyond Bizarre, bizarre, Bizarre News, fire ants, maggots, zombies. Bookmark the permalink.